But the long drive can sometimes be a drag! 8 hours on the road to & from Penang for char kuey teow just sounds too daunting! Why not stay the night so that the trip is more enjoyable, and you get to eat even more? :P Expedia.com.my is currently offering an ongoing Malaysia Grand Sale for local destinations, perfect for your weekend food hunts. Deets at the end of this story. Ready to check out these legendary food spots now? Loosen that belt, here we go! Around since: 1928 (88 years and counting). 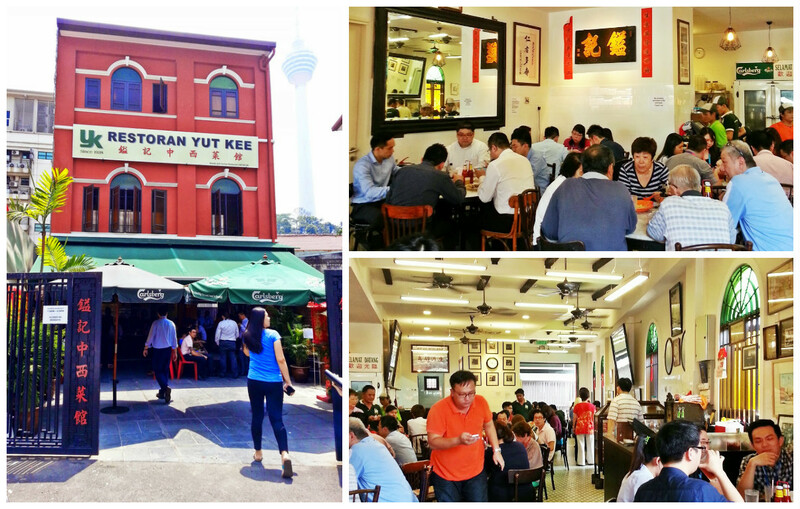 KL-ites have been flocking to this kopitiam for years. It's ALWAYS crowded and more often than not has a ridiculously long queue (but don't worry, they're extremely efficient so you'll get your food in no time! ), especially on weekends which means you'll probably end up sharing a table with strangers. For a moment there, we all panicked when the much beloved shop disappeared from Jalan Dang Wangi but we soon relaxed when it popped up in a new location in Jalan Kamunting. - How could you go to a Hainanese speciality restaurant and NOT order a Hainanese chicken/pork chop? Yut Kee's version is dipped in an egg and soy sauce batter before being deep fried to golden-brown perfection and served with brown gravy, fried potatoes and vegetables. - The humble roti babi may not look like much but you should know better than to judge something by how it looks. This buttery egg batter coated bread sandwich, generously filled with pulled pork, lap cheong (chinese pork sausages), sauteed onions, and freshly sliced cucumber & tomatoes will make your tastebuds and tummy very happy. - Their in-house baked marble cake will leave you licking your fingers and making sure to swipe up every last crumb and morsel. It's pretty much impossible to get your hands on unless you place an order in advance BTW. - Don't let anyone call you boring or predictable for ordering a good old kopitiam staple. They'll be the ones dying of jealousy when the plates of wobbly soft-boiled eggs and crispy toast hit the table and they don't get to have any. P.S if you're there on a weekend, you absolutely have to order their special roast pork! Each bite of those glistening slices is pure heaven. Address: No.1, Jalan Kamunting, 50300 Kuala Lumpur, Malaysia. Opening hours: 7.30am - 4.30pm (Tuesday - Sunday, closed on Monday). Around since: 1936 (80 years and counting). The tai ('big') in their tai pau (big bun) isn't there just for show, all their various pau are huge enough to live up to the name! You've never seen pau so pure white, soft and fluffy, they're practically like clouds on your plate. - Don't expect to get the typical sticky and sweetish chunky kind of filling when you order a char siew pau (BBQ pork bun), the Low Yong Moh version is their own original recipe. Cooked in their thick gravy of a secret sauce, the incredibly flavoursome filling is more wet than usual and has the consistency of shredded pork. - And don't forget to give the unconventional pork belly pau a try too, it literally contains an entire bar of pork belly! Address: 32, Jalan Tukang Emas, 75100 Melaka. Opening hours: 5.30am – 1pm (Monday and Wednesday - Sunday; closed on Tuesday). Around since: 1918 (98 years and counting). 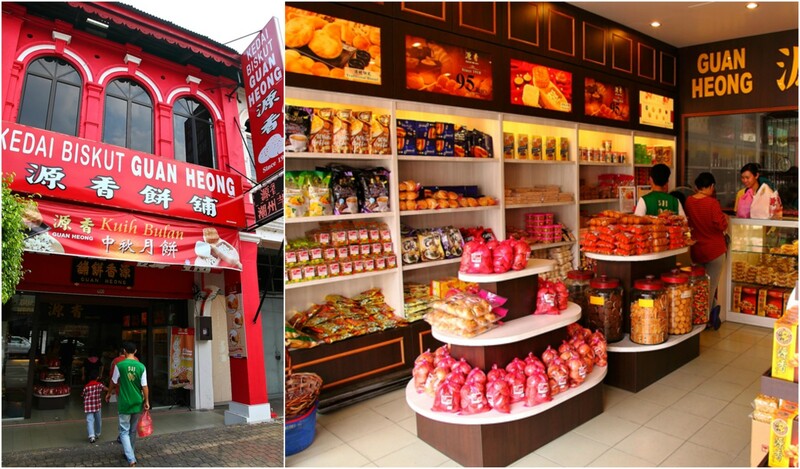 Guan Heong holds its head high as the first ever bakery to be opened in Ipoh New Town. The business is now being managed by the Sitt family's third generation but one thing that hasn't changed is their philosophy of making fresh pastries with high quality ingredients and no artificial flavouring. - Meat floss with lotus paste biscuit: the salty meat floss balances with the fragrant lotus paste to create a perfect blend of sweet and savoury. - Dried pork with lotus paste biscuit: you'll find meaty slices of bak kua (Chinese pork jerky slices) encased within lotus paste. - Meat floss with salted egg and lotus paste biscuit: the creamy salted duck egg yolk adds richness to the biscuit and harmonizes beautifully with the pandan lotus paste and meat floss. 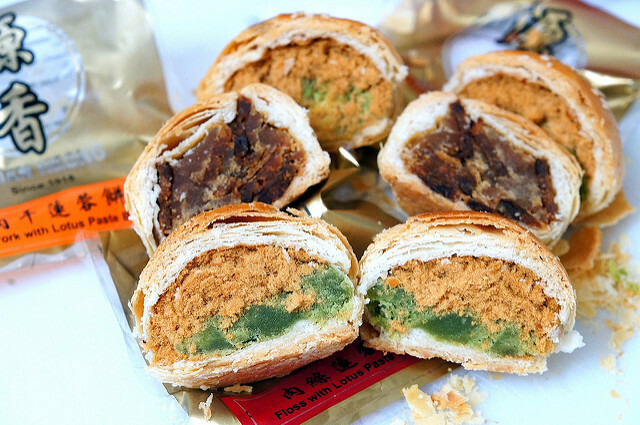 - The traditional Hokkien mooncake (pictured above right) holds a filling of winter melon, melon seeds, nuts, dried orange peel and fried shallots within a flat crusty pastry shell. It's topped with sesame seeds and flavoured with Chinese five spice. - The Teo Chew mooncake (pictured above left) is essentially the same as its Hokkien counterpart except that it's savoury hit comes from the addition of mui choy (Chinese preserved salted vegetable) instead of Chinese five spice. The pastry is also slightly different as it's more flaky and layered. Address: 160, Jalan Sultan Iskandar, 30000 Ipoh, Perak. Opening hours: 9am - 7pm (Monday – Saturday); 10am to 3pm (Sunday). It all began with a humble roadside stall along Lebuh Keng Kwee. 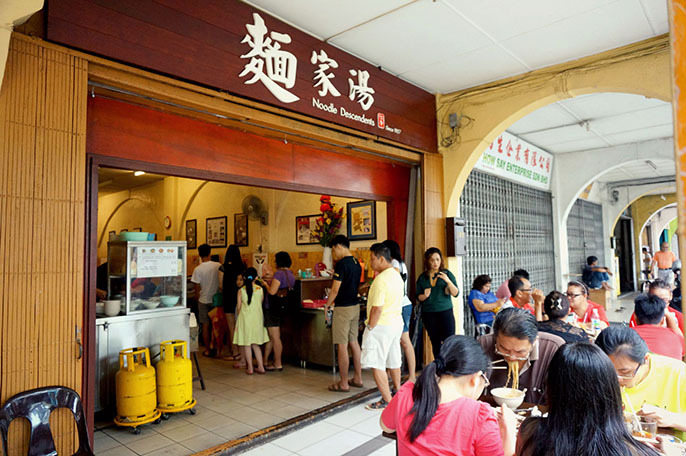 Fast forward 48 years later to 1984 and the stall had become so popular that its founder Mr. Tan Teik Fuang was able to expand his Penang Road Famous Teochew Chendul into franchise outlets while still maintaining his original stall. 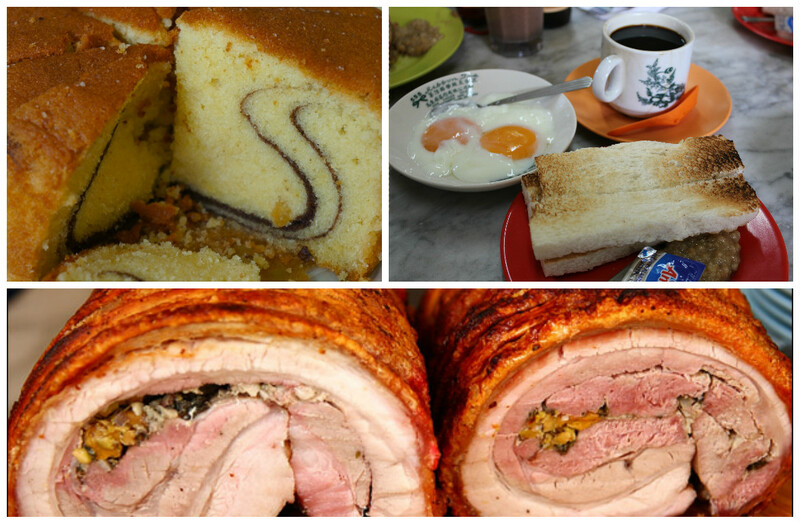 He also started expanding the menu to include other favourite local Penang delicacies. - Chendul of course! There's nothing better on a blazing hot day (like the ones we've been having recently) than an ice-cold bowl of that sweet coconut milk and gula melaka liquid. Ahh we can practically taste it now, so syok man! It comes in 3 varieties, Original, Durian and White Coffee. - The broth of their asam laksa is particularly aromatic and tangy. Plus, the dish comes generously topped with shredded fish. 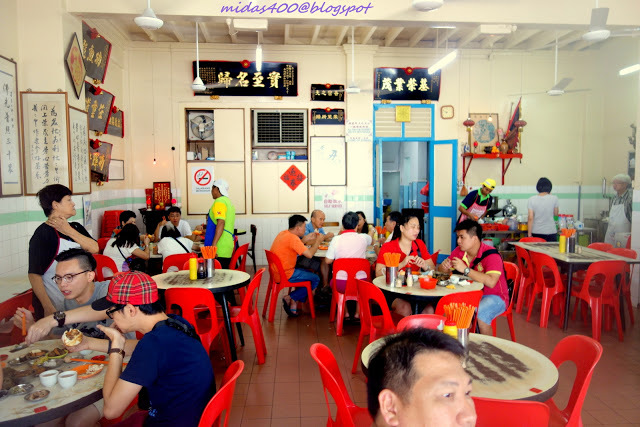 - For those of you who have never had Teochew Rojak, you're totally missing out! Sliced fresh fruits mixed with fermented shrimp paste and crushed roasted peanuts may sound weird at first but trust us, one bite and you'll be hooked for life. Address (for the original roadside stall): 27 & 29 Lebuh Keng Kwee, 10100 Georgetown, Penang. Opening hours: 10.30am - 7pm (Monday - Friday); 10am - 7.30pm (Saturday & Sunday). Around since: 1953 (63 years and counting). 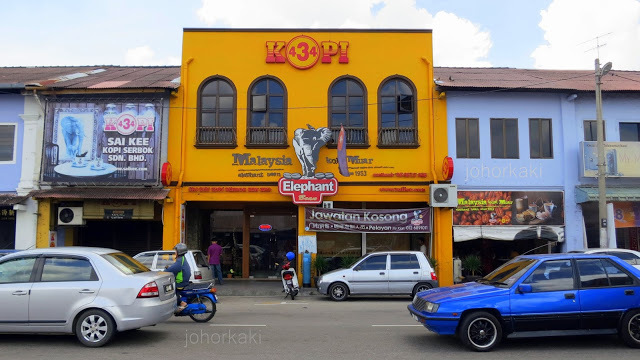 Say '434' while in Muar and chances are people will think you're talking about 'Kopi Cap 434', the much loved coffee brew housed in this sunny bright yellow establishment. Its founder, Mr. Kiar Am Sai has made a name for himself and his store amongst coffee lovers, particularly for a rare Liberica species of coffee bean called the Elephant Bean AA. This exotic blend results in a very unique taste, one that is relatively bitter with a nutty undertone. DUH, sure lah the coffee! The best thing about this place (other than the fact that they produce and roast their own varieties of coffee beans) is that you get the best of both worlds here. 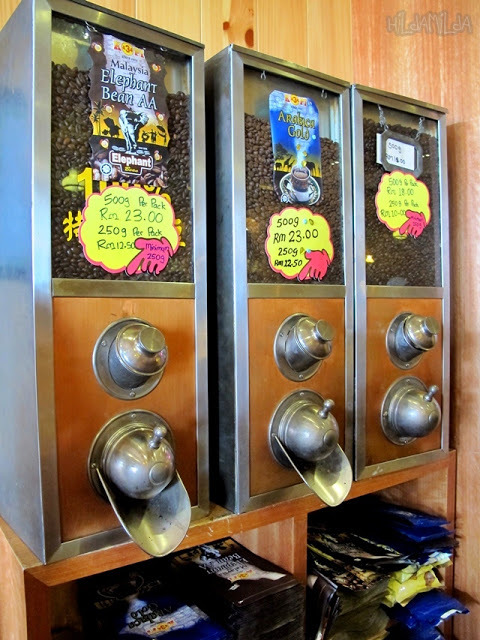 After selecting your preferred coffee blend, you're then able to choose whether you want to have them in our local style (kopi peng, kopi o, etc.) or in the western style (latte, cappucino, etc.). So no matter what kind of a coffee drinker you are, you'll definitely find something that meets your fancy. 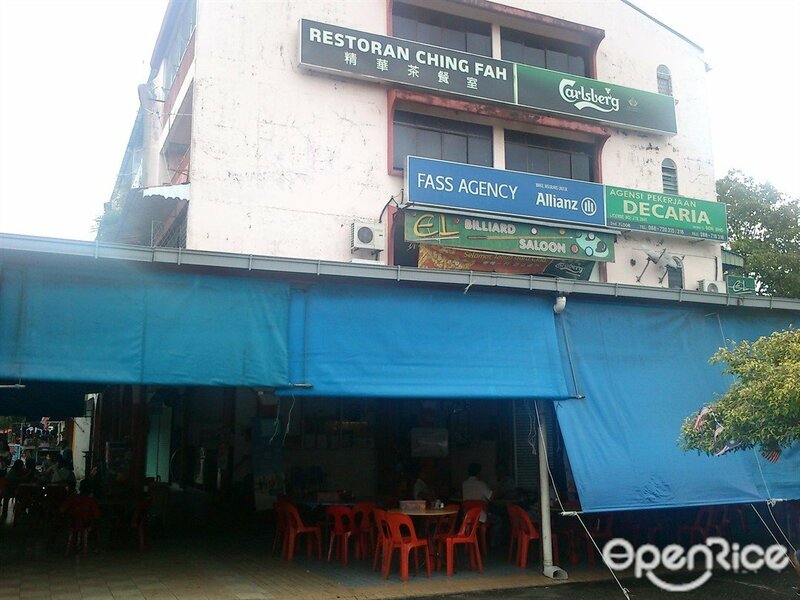 Address: No 121, Jalan Maharani, 84000 Muar, Johor. Opening hours: 8am to 5.30pm daily. Around since: 1964 (52 years and counting). Mr. Hee a.k.a Ah Lok used to be a bus driver before he decided to open Ching Fah after being trained by a master chef from Hong Kong who used to work at the famous Borneo Hotel in Kota Kinabalu. Ah Lok's son took after his father, quitting his job as a successful timber businessman back in 1997 to help out with the restaurant. It quickly became a local favourite eatery and has withstood the test of time to remain highly popular, especially during lunch hours. 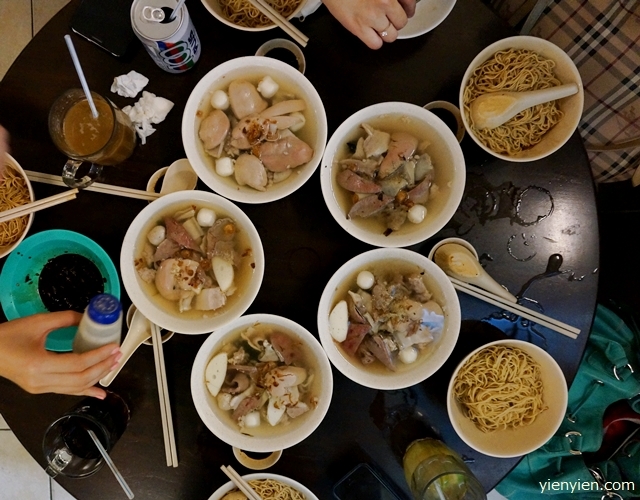 - Just because you may not have heard of kon lou mee or fried tuaran mee before, doesn't mean that you shouldn't step out of your comfort zone and give these local Sabahan dishes a try. At Ching Fah, the former is served drizzled with signature special sauce and topped with their homemade char siew or steamed boiled chicken, while the latter is fried with mixed local fresh vegetables, egg and char siew. 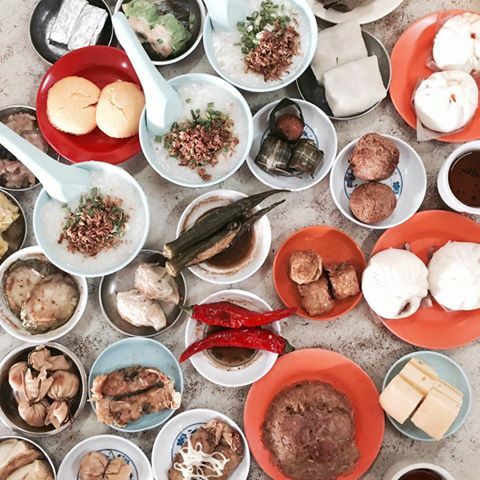 - Ching Fah takes their chap fan (economy rice) game to the next level with a spread that boasts over 40 dishes, making it a lunchtime favourite. Address: Block J, Lot 1, Pekan Dongonggon Baru, Penampang, Sabah. Opening hours: 6am - 4pm daily. Around since: 1957 (59 years and counting). 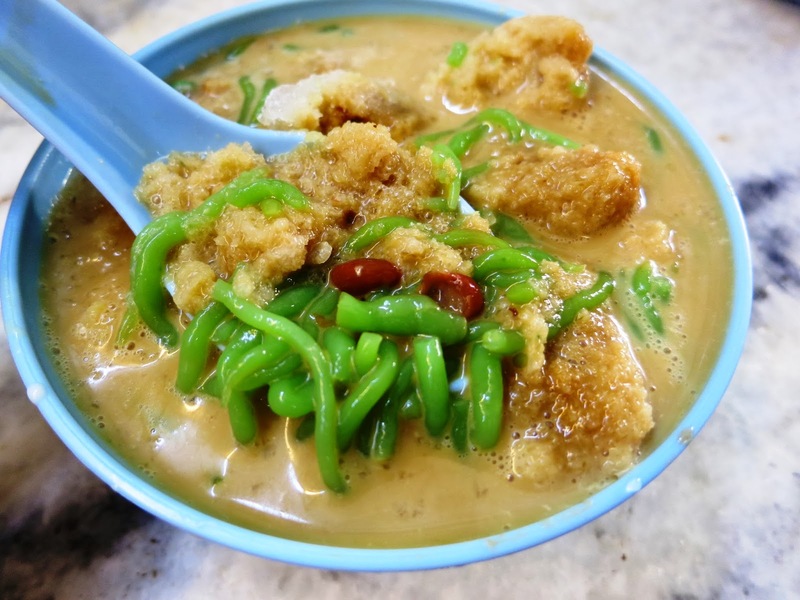 For as long as Malaysia has had its independence, a corner shoplot located at Bishop Gate (a small lane off Carpenter Street) called Min Joo Cafe has had Sarawakians eagerly queuing up to slurp up bowls of noodles and soup. Though they moved to a Pandungan Road in August of 2012 and re-opened under the new name of Noodle Descendents, rest assured that the quality of food has not diminished in the slightest. And neither has it's popularity! Even after you manage to snag a table, you'll probably have a long wait ahead of you for your food but it'll all be worth it in the end. - Zheng (or cheng in Kuching) noodles a.k.a pork offal soup that is served with a separate bowl of noodles that have been lightly dressed in black vinegar. The almost reflectively clear consommé pork broth is stuffed full with various pork innards like kidney, liver, intestines, stomach and pork belly slices PLUS some additions of fish cake, fish balls, salted cabbage and seaweed. Talk about a satisfying and flavourful bowl of porky goodness! 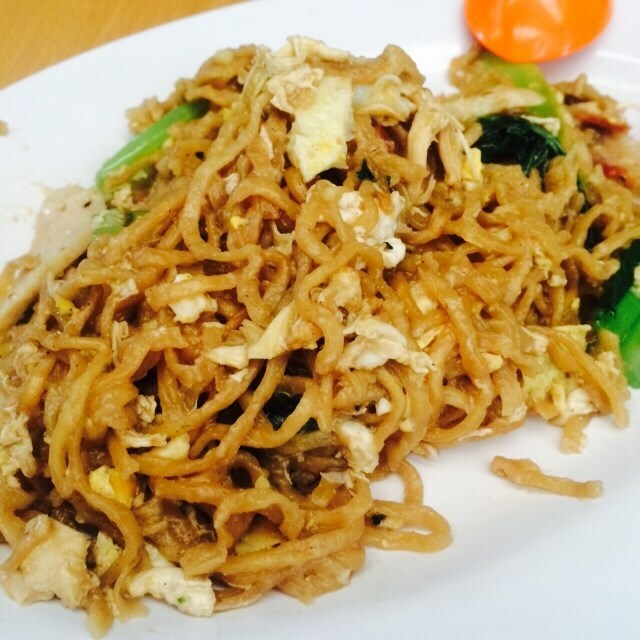 - Also not to be missed is the famous Sarawak kolo mee. 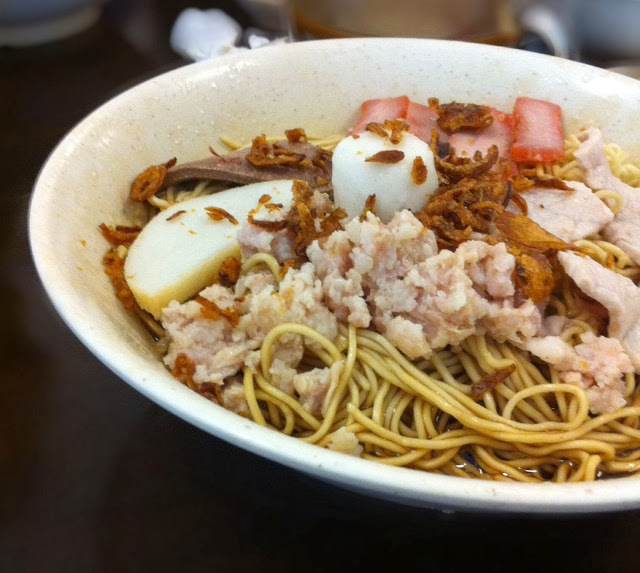 The bouncy and chewy noodles are tossed in a sauce of shallot oil, lard and malt vinegar before being topped with minced pork, slices of char siew and boiled pork, fish cake, fish ball and fried shallots. You'll be licking the bowl clean! Address: No. 188, Jalan Padungan, 93100 Kuching, Sarawak. Opening hours: 7.30am - 3.30pm daily. And like we mentioned earlier, now's your chance to go on a hassle-free foodie trip by staying at all the locations on your list! 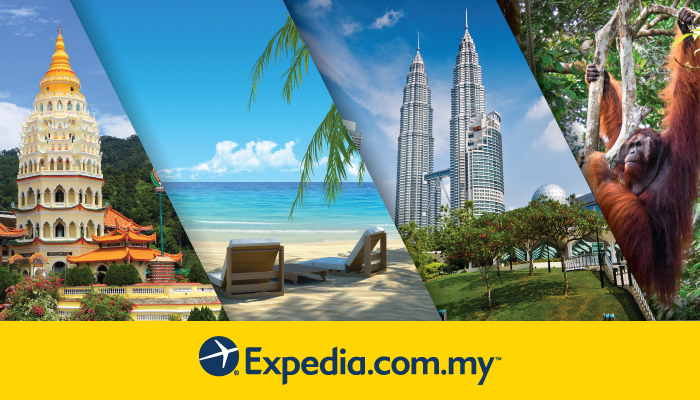 In conjunction with the ongoing Malaysia Grand Sales, Expedia.com.my is having a hotel sale for domestic destinations across Malaysia. Booking period: Now – 31 July 2016. 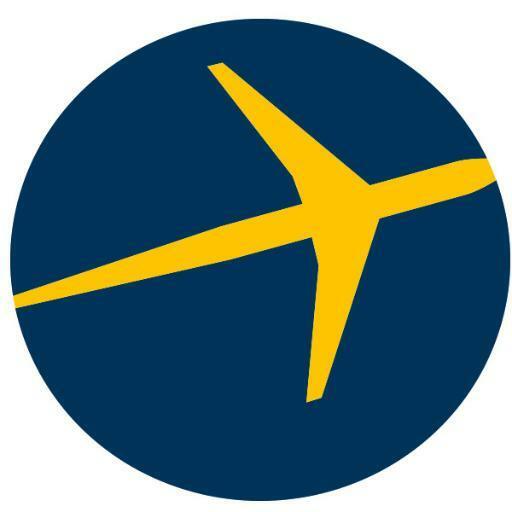 Travel period: Now – 30 September 2016. Destinations: Penang, Langkawi, Kuala Lumpur, Johor Bahru, Ipoh, Melaka, Kota Kinabalu & Kuching. Price: 3D2N stay from as low as RM73 per pax. Take advantage of this opportunity and book now before the deal ends so that you can om nom nom your way through Malaysia! Rich in history... and food too! Spices abound in the local food scene down south!